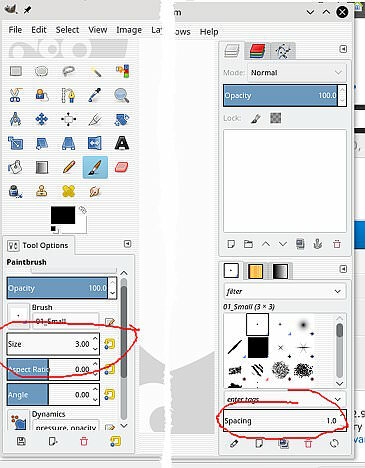 On GIMP 2.8 on my mac, I can't find the brush "Size". I attached a picture of my display. It shows "Spacing", but not "Size". Where can I find it? please help. You are looking at the Brush Dialogue. The Size Control is in the Tool Options. That is because you have closed the tool options sometime. Maybe you were trying to make Gimp look like PS, a common mistake. Ok everything and restart Gimp. That gets the default 3 Window mode. Strongly advise Windows -> Single Window mode while you are getting used to the Gimp interface. Brush spacing is in the brushes dock but the spacing (and everything applicable) is in the tool options.